Tempting though it is to share relaxing, riverside images of Tavira, I thought I’d indulge in a little tram spotting in Nottingham instead. Now, I know tram spotting isn’t everybody’s idea of relaxation, but I’m reluctant to let go of time spent with my daughter. And the wine bar that was our first port of call (That gives a terrible impression, doesn’t it? But probably the correct one 🙂 ) was conveniently located, right beside the tramlines. We had already debated the ‘Pitcher and Piano’, a favourite venue, inside that church that you’re looking at, but opted instead for a sunny corner to catch up on life. I’ve always loved trams and Lisa humoured me, as I bobbed up and down to read the names. 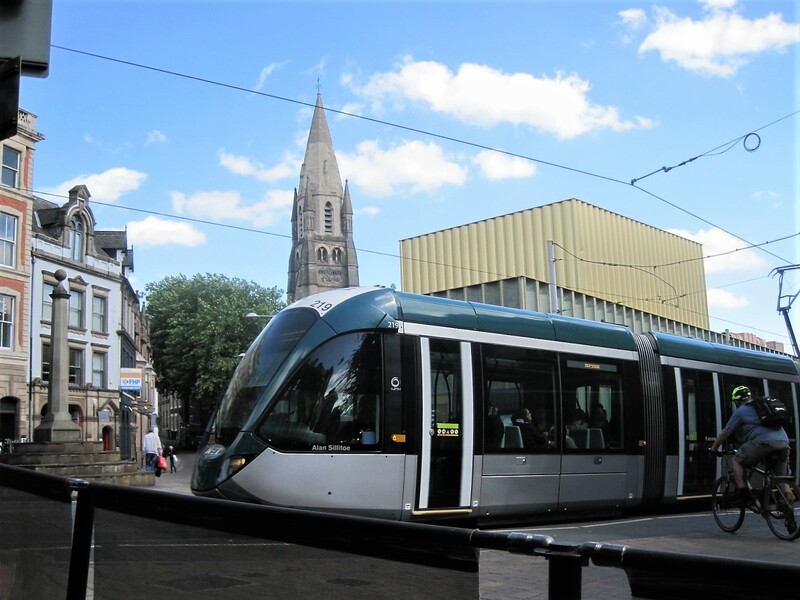 The trams are named after local heroes of past or present. Robin Hood, of course. Brian Clough and Rebecca Adlington from the sports world. Lord Byron and his daughter Ada Lovelace. D.H. Lawrence and Alan Sillitoe. All spotted, and more besides. My one regret, I didn’t see Torvill and Dean! Nottingham is never short of quirky in any respect, and as we ambled the streets towards home I recorded a few random impressions. Mosaic seemed to be big news in Sherwood, a very crafty area. A stylish violin…and more lace! And just for those people who think I exist on cake, we did manage some nourishment, along with the wine. I had a lovely, relaxing time in Nottingham. No cooking, no cleaning, wonderful company! The Sunday morning of my return home, I suggested brunch as a treat on the way into town. The food was great, but we did wonder why the place was so busy. It’s Amy’s turn to host the Lens Artists Photo Challenge this week. I hope she won’t mind my rather frivolous version of Time to Relax.